This page applies to staff who use Banner Admin Pages (also called Banner 9), the administrative side of Banner (not to be confused with Banner Self-Service). Banner Admin Pages is also supported on tablets. 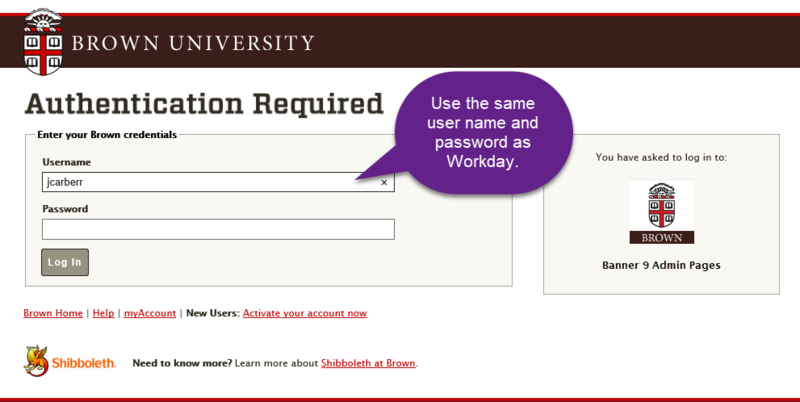 Use your Brown user name (for example, jcarberr) and the password you maintain in myaccount.brown.edu—same as Workday. Log in to Banner Admin Pages and, as you watch, pause the video and try what's demonstrated yourself. Common actions have keyboard shortcuts. Download the Banner Keyboard Shortcuts job aid (use the 2 far-left columns for our version). You are able to log on to Banner Admin Pages, but when you navigate to an admin page (previously called forms) the page is blank. Clear your browser cache, and then restart your browser. The cursor is positioned in a field on an admin page where you should be able to enter data, but nothing happens as you type. At some point in the session, the user opened an admin page using the "Recently Opened" icon on the menu panel. Point your mouse somewhere in the browser window outside of the admin page itself and click, then position the cursor back in the field on the admin page and click again. For example, you could position the cursor on the left-hand side of the browser window in the grey area of the Banner 9 menu panel (but not positioned on one of the menu panel icons). Clicking there and then returning the cursor to the field in the admin page and clicking again should allow you to enter data into the field. The Banner vendor is aware of this issue, but has yet to resolve it. Where do I go for help or questions about Banner Admin Pages?